Rosemary Monette is a Registered Dental Hygienist with an Expanded Practice License. 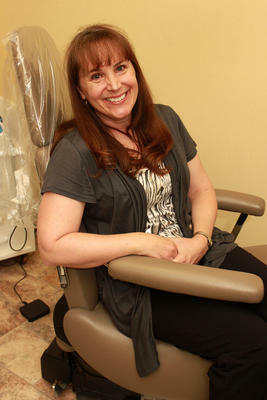 She has over 30 years of experience in the dental health care field. She graduated from Chabot College in Hayward, California with Highest Honors; in addition she was recognized for having the highest GPA of her graduating Dental Hygiene class in 1981. She has extensive experience in non-surgical periodontal therapy, having worked over 15 years in periodontal speciality offices, while working over 30 years in general dental offices, serving both adults and children. She was born and raised in San Leandro, California and moved to Grants Pass, Oregon in 1990 with her husband Don, three daughters, and one son. Since then the family has grown to include two son-in-laws and five grandchildren. Rosemary has an unending committent to providing the highest quality of care her patients deserve. Her patients find comfort placing their trust in her and frequently thank her for her warmth, honesty, gentile touch, thoroughness, and caring personality. In 2011 she received her Expanded Practice License, which allows her to work independently in settings other than a dental office and without the supervision of a dentist. In her medical clinic setting or in nursing facilities or private homes with homebound persons, she is able to serve our young and adult populations. Offering an alternative to a traditional dental office setting allows her dental hygiene care to be more accessible to those in need.